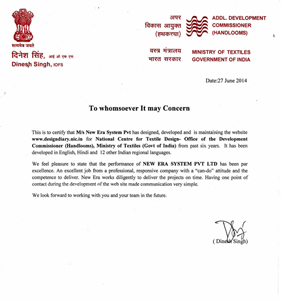 M/s New Era System Pvt Ltd. has designed, developed and is maintaining the website www.designdiary.nic.in for National Centre for Textile Design- Office of the Development Commissioner (Handlooms), Ministry of textiles (Govt of India) from past six years. it has been developed in English, Hindi and 12 other regional languages. 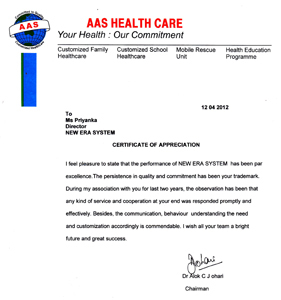 We feel pleasure to state that the performance of New Era System Pvt Ltd has been par excellence. An exceeent job from a professional, responsive company with a "can-do" attitude and the competence to deliver. New Era works diligently to deliver the projects on time. Having one point of contact during the development of the website made communucation very simple. 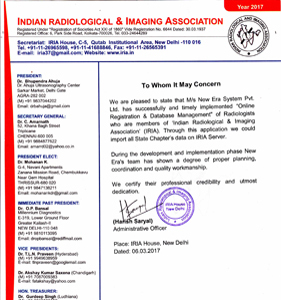 We are pleased to state that M/s New Era System Pvt Ltd has successfully and timely implemented "Online Registration & Database Management" of Radiologists who are members of Indian Radiological & Imaging association (IRIA). Through this application we could import all state chapter's data on IRIA Server..
During the development and implementation phase New Era's team has shown a degree of proper planning, coordination and quality workmanship. We certify their professional credibility and utmost dedication. It is really admiring that M/s New Era System Pvt Ltd. successfully implemented an automated, web based e-voting in Indian Radiological & Imaging Association(IRIA), New Delhi, India. 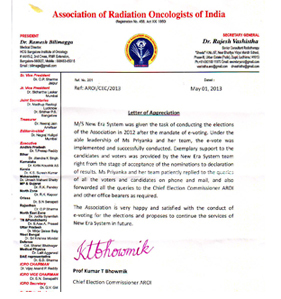 The Indian Radiological & Imaging Association greatly appreciates the timely manner in which New Era undertook the e-voting project and returned quality output. It is rare to find such high standards of sincerity and trustworthiness in the world of business today. It would be our pleasure to do business with you in the future too and i earnestly wish you the very best for a great future. M/s New Era System Pvt Ltd. was given the task of conducting the elections of the association in 2012 after the mandate of e-voting. Under the able leadership of Ms Priyanka tomar and her team, the evoting was implemented and succesfully conducted. Exemplary support to the candidates and voters was provided by the New Era system team right from the stage of acceptance of the nominations to declaration of results. Ms Priyanka and her team patiently replied to the quries of all the voters and candidates on phone and mail, and also forwarded all the queries to the Chief Election Commissioner AROI and other office bearers as required. The Association is very happy and satisfied with the conduct of e-voting for the elections and proposes to continue the services of New Era System in future. I Feel Pleasure to state that the performance of NEW ERA SYSTEM has been par excellence. The persistence in quality and commitment has been your trademark. During my association with you for last two years, the observation has been that any kind of service and cooperation at your end was responded promptly and effectively. Besides, the communication, behaviour understanding the need and customization accordingly is commendable. I wish all your team a bright future and great success. 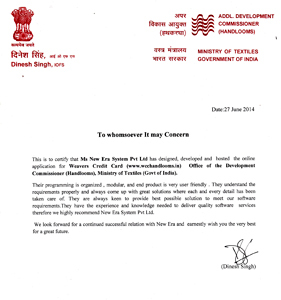 M/s New Era System Pvt Ltd. has designed, developed and hosted the online application for Weavers Credit Card for Office of the Development Commissioner (Handlooms), Ministry of textiles (Govt of India). Their programming is organized, modular and end product is very user friendly. They understand the requirements properly and always come up with great solutions where each and every detail has been taken care off. They are always keen to provide best possible solution to meet our software requirement. They have the experience and knowledge needed to deliver quality software services. 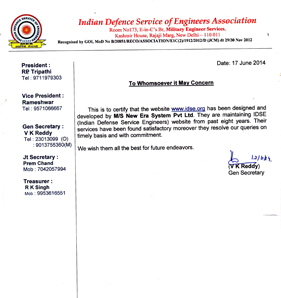 This is to certify that the website www.idse.org has been designed and developed by M/s New Era System Pvt Ltd. they are maintaining IDSE (Indian Defence Service of Engineers Association) website from past eight years. Their services have been found satistactory moreover they resolve our queries on timely basis and with commitment. We wish them best of luck in their future endeavors. 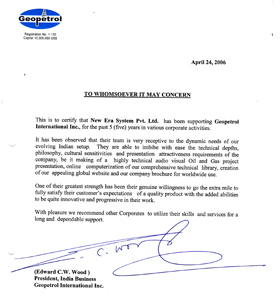 This is to certify that New Era System Pvt Ltd has been supporting Geopetrol International Inc. for the past 5 years in various corporate activities. It has been observed that their team is very receptive to the dynamic needs of our evolving Indian setup. They are able to imbibe with ease the technical depths, philosophy, cultural sensitivities and presentation attractiveness requirements of the company, be it making of a highly technical audio visual Oil & Gas project presentation, online computerization of our comprehensive technical library, creation of our appealing global website and our company brochure for worldwide use. One of their greatest strength has been their genuine willingness to go the extra mile to fully satisfy their customer's expectations of a quality product with the added abilities to be quite innovative and progressive in their work. With pleasure we recommand other corporates to utilize their skills and services for a long and dependable support. 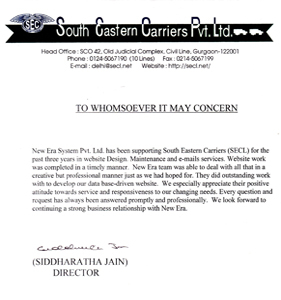 President, India Business, Geopetrol International Inc.
New Era System Pvt Ltd has been supporting South Eastern Carriers (SECL) for the past three years in website design, maintenence and email services. Website work was completed in a timely manner. New Era team was able to deal with all that in a creative but professional manner just as we had hoped for. They did outstanding work with to develop our data base-driven website. We especially appreciate their positive attitude towards service and responsiveness to our changing needs. Every question and request has always been answered promptly and professionally. We look forward to continuing a strong business relationship with New Era. M/s. 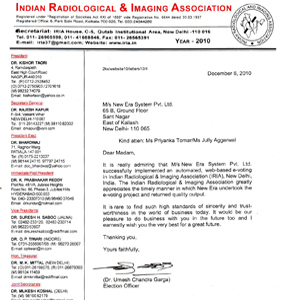 New Era System Pvt Ltd. have designed our software for calibration of instruments. 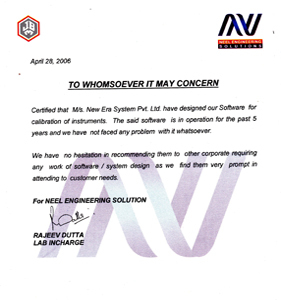 The said software is in operation for the past 5 years and we have not faced any problem with it whatsoever. We have no hesitation in recommending them to other corportae requiring any work of software/ system design as we find them very prompt in attending to customer needs. We are pleased to certify that M/s New Era System Pvt Ltd have designed our website and the same is in operation for the last over 4 years. We find them highly skilled in design and prompt in attending to customer querries/ problem if any. We are happy to recommend them to all corporates requiring job in designing websites, technical presentations and any such work requiring skills and focused attendance. 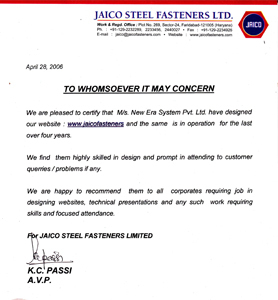 AVP, Jaico Steel Fasteners Ltd. Copyrights 2017-18. All rights reserved.